Aaron P. Bernstein/Getty ImagesJohn Kelly and Donald Trump. 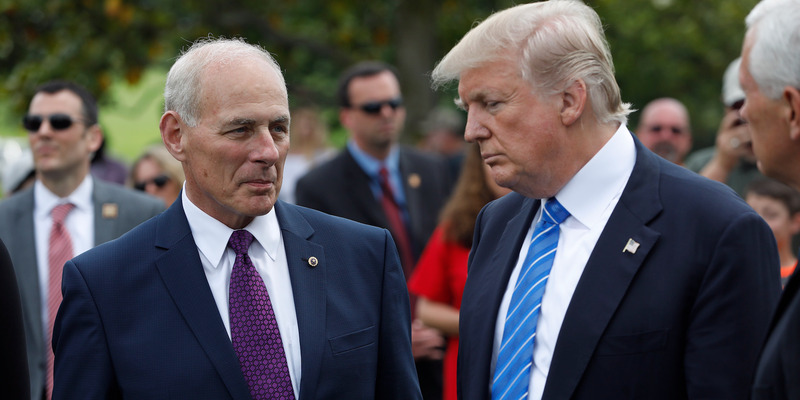 White House chief of staff John Kelly hasn’t been involved as much lately in President Donald Trump’s decisions, according to Bloomberg News. Kelly reportedly wasn’t involved in Trump’s ouster of national security adviser H.R. McMaster, and wasn’t in on the president’s call with Russian President Vladimir Putin. Kelly’s diminished influence comes as Trump considers doing away with a chief of staff and a communications director altogether. John Kelly’s influence over President Donald Trump has diminished in recent weeks, Bloomberg reported Thursday, citing at least a dozen White House aides, former staffers, and outside advisers. The president’s chief of staff has reportedly been left out of key decisions, including last week’s ouster of national security adviser H.R. McMaster and the hiring of John Bolton, the former US ambassador to the UN. But Kelly was part of the decision to replace Veterans Affairs Secretary David Shulkin with Ronny Jackson, the official White House physician, on Wednesday. Kelly has also been sidelined during Trump’s calls with foreign leaders, according to Bloomberg. When Trump spoke with Russian President Vladimir Putin last week, for example, Kelly reportedly wasn’t in the room. Does Trump want a chief of staff at all? Kelly’s diminished influence comes as Trump appears to be increasingly open to the idea that he doesn’t need a chief of staff or communications director to keep him in line and on message. CNN reported that some of Trump’s outside consultants have been urging him to do away with those traditional White House roles, arguing that if his freewheeling style brought him to the White House, there’s no sense in trying to contain it. Trump has not yet indicated whether he agrees with this strategy. Last month, two of Trump’s trusted White House associates – Communications Director Hope Hicks and staff secretary Rob Porter – resigned. The exodus reportedly left Trump disappointed, but also emboldened, believing that he might not need as many confidantes as he thought. Kelly entered the White House last July after the departure of Reince Priebus. Although he was believed to be a moderating influence on the president – tasked to contain the chaos and cut down on leaks – Kelly ended up becoming the center of the very same drama that he had set out to end. In February, Kelly drew the ire of the president when he defended Porter against allegations that Porter had physically abused his two ex-wives during their marriages. Both of the women, Colbie Holderness and Jennifer Willoughby, provided the Daily Mail with photographic evidence of the alleged abuse. But Kelly, who was said to be close with Porter, initially defended him. He later backtracked when more evidence of Porter’s abuse surfaced. But by then, the damage had been done. Kelly’s actions reportedly angered Trump, who believed they reflected poorly on his administration. But despite his frustrations, Trump insists he doesn’t plan to fire the retired four-star Marine general.